Shrishti says that Preeta should marry Karan and till than they will be able to make Manisha tell the truth, both Preeta and Rishab are against this but Karan says that this will be the best plan, Rishab asks Shrishti to sit in the Mandap but she says that Preeta cannot do anything that is wrong and she will ruin their plan. Preeta agrees and they try o get the dress from Kartika’s wardrobe. Samer makes Manisha mother go away and they get a couple of minutes. Kartika and Shrishti are not able to find a copy of the Lehnga and work out a new plan. Preeta disagrees and says that they must think of a new plan, Kartika and Shrishti take Manisha to the bathroom and change her clothes, Shrishti takes Preeta inside. Rishab says to Karan that if he feels that something is wrong and they are not back then he must get up and abort the marriage, Karan however says that he will marry her if they do not come because she is better than Manisha, Rishab gets tensed requesting that he does not do anything of the sort. Shrishti comes outside saying that she was very tensed and not listening and even scratched her face, just than Preeta comes outside everyone is left looking at her, Karan ask her where Doctor Preeta is because she is a bit different. Preeta says that she will walk from the Mandap after ten minutes. Rishab says that he had swore that he will not let him get married and if this happens than he will be married so he will go instead of Karan, Karan says that he knows that Rishab loves him a lot of but if he goes than everyone will see his face and then a new problem will arise so he must go himself. Preeta and Karan leave which makes Rishab feel nervous as he was not able to tell Preeta the truth which was in his heart. Karan and Preeta are in the Mandap while everyone around them is tensed. Prithvi prays that they both get married. The Pandit asks the permission to start the ceremony and her mother says something, Preeta asks what she said, he says that she meant that she was with Karan alone in his room, than she must understand what Manisha mother meant. Kartika and everyone else are trying to question Manisha but she is not saying anything worth much, Rishab takes over and again asks her to tell his name and the name of the mastermind who was behind all of this. The wedding ceremony continuous and they reach towards the end of the wedding, Karan and Preeta are told to stand for the ceremonial circles that have to be completed to conclude the wedding. Karan asks Preeta to come but she disagrees he however says that everyone is watching but she does not listen and even when he is standings he does not give in but getting scared finally give sin. Karan takes the Haar and then they both place it on each other’s neck. Precap: Pandit ask than to stand for the circling, Preeta however disagrees but eventually stands and Karan starts to take them but she thinks of a new plan. 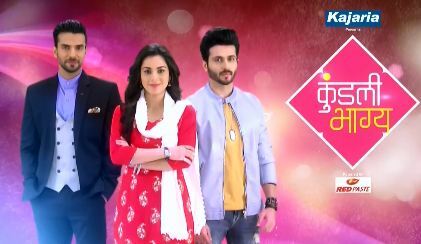 The post Kundali Bhagya 25th February 2019 Written Episode Update; Karan and Preeta are about to get married appeared first on Telly Updates.